LibraryLyssa: Come for the library talk, stay for the food. We’ve had some library talk, let’s have some food! I like to cook and LOVE to eat. I’m not a terrible cook , but I won’t be getting a Food Network show anytime soon ( a girl can dream, right?). I rarely create my own recipes (BAD THINGS HAPPEN WHEN I GO ROGUE IN THE KITCHEN) but love to tweak recipes I find in cookbooks and online. At the library, we rarely have food at programs. There are exceptions and our annual Pumpkinpalooza is a great example. I’m one of those people who LOVES all things pumpkin and for the past few years, I’ve shared that love through our Pumpkinpalooza program. The program consists of pumpkin themed crafts and some pumpkin flavored snacks. I found this recipe last year for Pumpkin Spice White Hot Chocolate and immediately pinned it on Pinterest. It sounded amazing AND it was done in a slow cooker. I was in love. A little tweaking of the recipe and it was ready for programming. The kids loved it! And staff doesn’t mind the leftovers either…. Add all the ingredients to a slow cooker and turn on low. Stir the mixture every 15-2o minutes, making sure you scrape up the chocolate from the bottom of the slow cooker. Hot chocolate will be ready in approximately an hour and a half! Turn slow cooker to warm to keep beverage warm while serving. Serves 8-10. 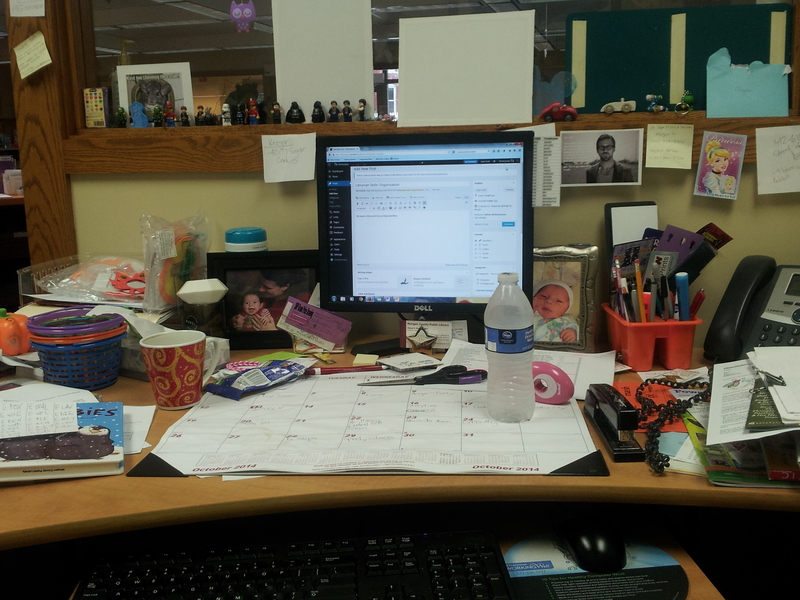 My name is Alyssa and I am an Organized Mess. This is to the left of my desk (hi Princess Labelmaker!). 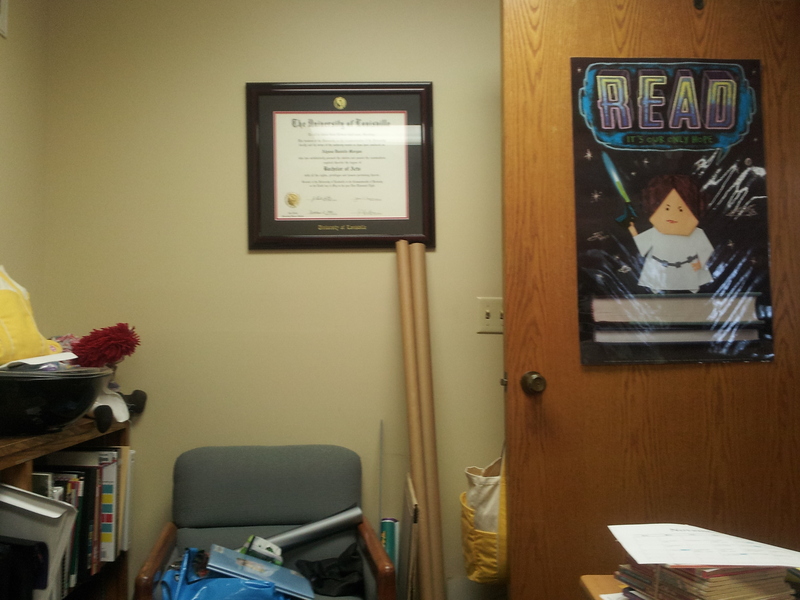 This is behind my desk. Yes, this looks like a pigsty (my home is far worse) and I should probably be ashamed to share it with the world. 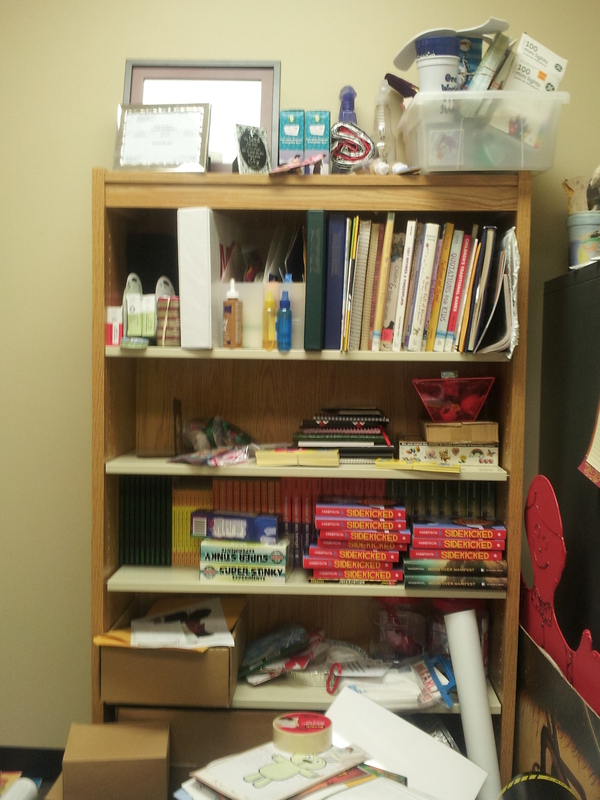 But you’d better believe I know where EVERYTHING is in my office. Could I send someone to find something in my office? Absolutely not, but I could find anything in less than 60 seconds. Except for the stapler remover. I can never find my stapler remover. I may not be good at organizing a space, but I would like to say that I’m pretty good when it comes to organizing a schedule. Since I’m the head of a department, I have to be able to sort out a monthly schedule for my self and my staff. How do I do it? Every year, I create a calendar in Microsoft Publisher for programming. This includes weekly programs, special program, and class visits. I go through and try to fill in all of the weekly programs for the year; I add the other programs as the year goes on. There are some programs, I know immediately who is doing what and fill in their name (i.e. weekly storytime). For other programs, I fill in who is doing what on a monthly basis (i.e. class visits). On the whole, this is a calendar for my eyes and my purposes only. Every month, I will print out the monthly calendar for each staff member and one copy for our Circulation Manager, who creates the master work schedule. We keep a weekly planner like this one on our circulation desk at all times. It lists every program we have during the week, as well as who is doing the program. Again, I fill out a big chuck of it at the beginning of the year and then add to it as the year goes on. It has also been helpful to write down our local school schedule in this planner, so we know when the kids are on break. I’ll also make a note of when I have a meeting. We don’t write down any vacations or personal appointments on this calendar because it is in public view. Desk Calendar- In addition to making a large and fancy coaster, this calendar gives me a quick glance of what’s going on during the month. Very helpful during phone calls when I’m trying to schedule quick meetings or class visits. Microsoft Outlook Calendar– This calendar is attached to my work email. I keep a lot of future dates scheduled here before placing them on any other calendar. It also sends me reminder messages of when things are coming up. Why three calendars with essentially the same information in each one? My brain requires repetition in order to remember something, particularly dates. By having to record the same information in several different places, it becomes easier for me to remember the date without having to look at the calendar. 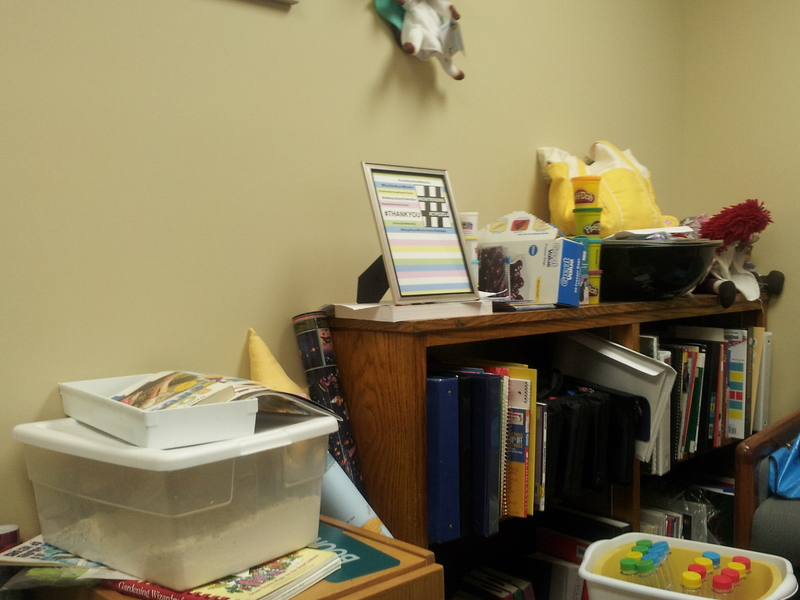 Maybe one day I’ll apply the same effort to cleaning my office that I do to organizing my schedule…. Shelby Cooper has always been warned about dangerous situations. To say her mother is overprotective of the nearly 18 year old is an understatement. But even an overprotective mother can’t keep Shelby from being hit by a car. When they leave the hospital, Shelby’s mother explains that they are in danger and are now on the run. As their journey takes them closer to the Grand Canyon, Shelby begins to question why they are on the run and who is after them. A mysteriou stranger named Mark and a coyote only add to Shelby’s confusion. She soon realizes that not everything in her past is the truth and that there will only be more lies along the way to finding out what is going on. Ok, it is REALLY hard to talk about this AWESOME book without giving everything away. This book features, and relies, upon 502 different twists (give or take a few). Some, you will see coming from a mile away; others will smack you upside the head. Nick Lake has given us a tale that is suspenseful and action-packed. My only slight issue with the book was the switch from Shelby’s present world to the world of The Dreaming (again, I really can’t say much more or I’ll give stuff away). Most of the transitions between the two worlds were easy to follow and flowed well with the rhythm of the story. There were a few moments where it felt forced and was hard to follow. If you can get through those few little hiccups, you will be well rewarded. There Will Be Lies by Nick Lake is scheduled to be published on January 6, 2015. 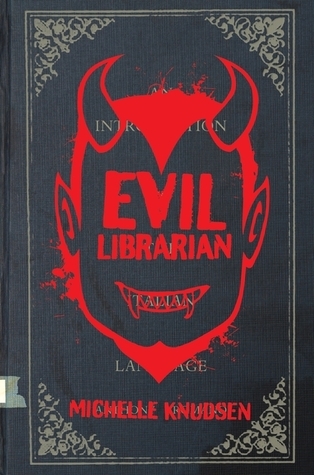 First of all, Librarians are NOT evil. Just this guy. Who happens to be a demon disguised as a librarian. Therefore, he is not really a librarian and my first statement remains true. In Evil Librarian by Michelle Knudsen, Mr. Gabriel, the new high school librarian, is young and GORGEOUS. Cyn can totally see why her best friend, Annie, is totally head over heels for him…until Cyn realizes that Mr. Gabriel is not what he seems. With a rare gift that makes her immune to his charms, Cyn sees Mr. Gabriel for what he really is- a demon who is slowly sucking the life force of all the teens in her school. Oh, and he wants her best friend to be his demon bride for all eternity. With the help of her crush, Cyn must find a way to defeat Mr. Gabriel, save Annie, and build an awesome barber chair for the Sweeney Todd production. No big deal. I LOVED this book. It appealed to the teen I was in high school and my inner theater nerd. Then seeing that it was by Michelle Knudsen who wrote my beloved Library Lion was an added bonus. And librarians are not evil. Just wanted to say that again.